Our model, TITAN, is coded in Python 2.7 and amounts to around 8,000 lines of code. A concise description of the model follows, TITAN is an agent-based simulation model used to explore contact transmission in complex social networks. Our team uses ABM to model the spread of disease and its reaction to public health interventions. The end goal of our team’s research is to guide the implementation of highly effective HIV prevention strategies that are more efficient, better targeted, and more responsive to the needs of risk groups. 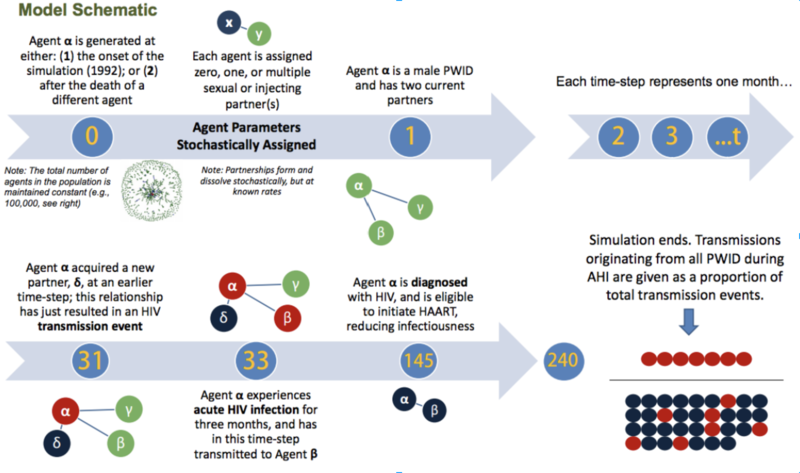 Below is a sample, step-by-step walkthrough of how our team uses ABM to track how agents develop relationships, contract HIV and/or adhere to HAART. Our model was developed specifically to track acute HIV infection (AHI). ⟵ What is Agent-Based Modelling?